Even when I read it or someone tells me they don’t like bananas I’m jaw dropped. How could someone not enjoy banana? Creamy, naturally sweet, full of potassium and one of the least expensive, nutritious foods you can buy. It’s true, though, bananas just aren’t at the top of everyone’s culinary wish list. In honor of all those friends I made up this Everything But Banana Smoothie. After all, not every shoe fits everyone the same way, so luckily there’s a smoothie for your likes and dislikes. To make up for the creamy, sweet flavor that you lose by skipping the banana I added my secret weapon: frozen mango. It gives smoothies that lush quality you want, but without the banana flavor you may want to skip. I add a whole lot of extras to this creation as well, but feel free to skip them as you jam everything into your blender. I try to get as much bang for my buck, sip after sip especially when it comes to my kids getting max nutrition in the morning, but you can leave many of them out if you don’t have them on hand. The most important part is getting all the vitamins and minerals you need from the avocado (another great thickener), strawberries and carrot. Also make sure not to skip the dates if you’re adding the fresh turmeric which is a magical healer when it comes to inflammation. The dates balance out the strong flavor of the turmeric and make it truly sing! 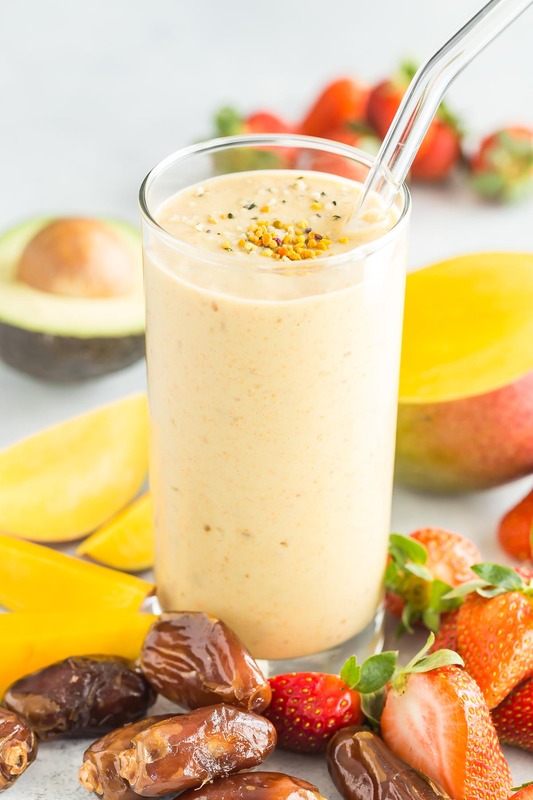 If you’ve got someone in your life that loves smoothies, but just can’t wrap their heads around eating banana, then this Everything But Banana Smoothie is for them. 1. Place all of the ingredients in a blender and puree until smooth. 2. Pour into a tall glass, pop in a straw and you’re ready! My 7 year old gets violently ill if she eats bananas. I find they are often key in most smoothie recipes, so I am always on the lookout for non-banana ideas. Thank you, can't wait to try this!